This can technically be a follow-up to my post on dining at Torrisi Italian Specialties since this popular sandwich shop has it's origins as a lunch counter next door. 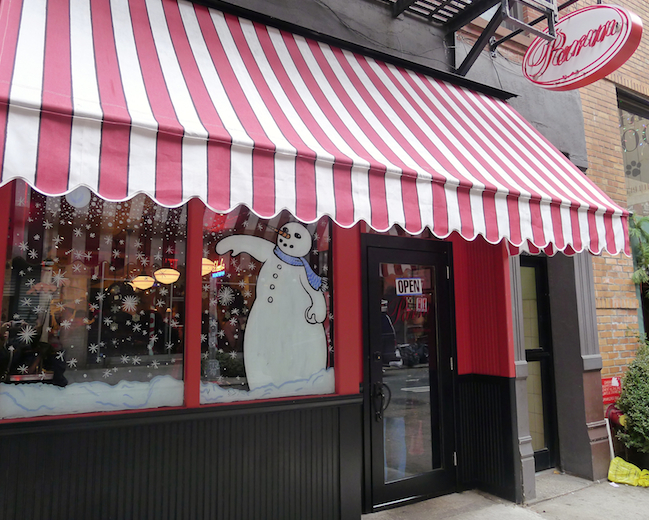 Parm is now a free standing operation with full sit-down service and a menu offering homestyle Italian-American classics centered around subs. 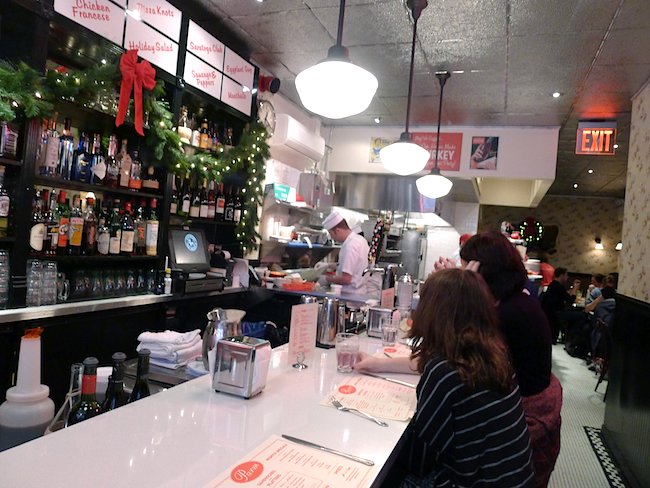 The decor has a cozy old school diner vibe with kitschy wallpapered walls, shiny red stools lining the counter and a handful of small closely placed tables in the back. They open for lunch at 11AM. We got there at around 11:30 and were able to score a corner table. 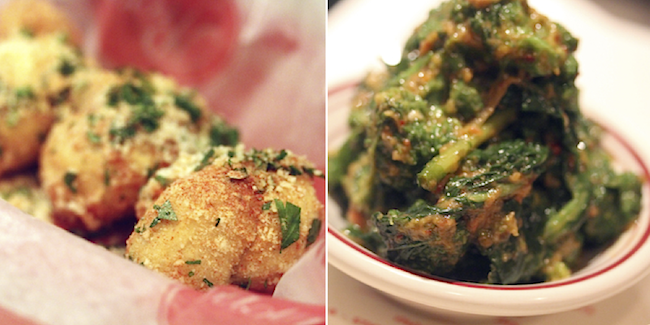 We started our meal with garlic knots and spicy broccoli rabe. The garlic knots were more cheesy than garlicky, not greasy and very good. Nothing like the kind you get from pizzerias but then these are 3 for $5. The broccoli rabe was tasty and had a nice kick though I didn't expect it to be served cold. Of course we had to try the eponymous chicken parm. We got the hero which features a double stack of breaded chicken topped with melted mozzarella and an outstanding marinara sauce on a toasted semolina roll. It was quite delicious as the elements and flavors of the sandwich were finely balanced. We also split one of their famous house roasted turkey sandwiches. 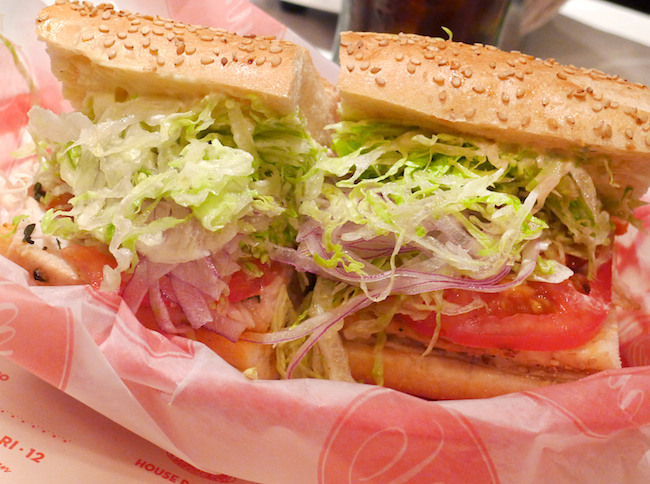 Slices of turkey are layered with lettuce, tomato, red onions, mayonnaise and a spicy red sauce on your choice of bread. The turkey was juicy and flavorful and the spicy sauce left a subtle trail of heat. It was excellent as turkey sandwiches go. The hubster had initially wanted a zeppole for dessert but we were stuffed by the time we finished our food. A return trip is surely in order. The line was about 10 deep out the door when we left. If you can't get there for lunch, they're open for dinner with nightly specials. And if you're a baseball fan like me, they also have an outpost at Yankee Stadium. YUM! it is only 9:30 and I am starving now! What a cute diner Rolala! I was totally drooling as you were listing the menu items and the photographs have me super HUNGRY. HaHa I love the decor on the outside. Very sweet indeed! this looks amazing! i have been craving a great sandwich for 5 months now! Yum! Looking at the address I even know where it is & I've only been to NYC twice!!! How I've never come across this place...I'm not sure. I have a horrible weakness for little italy. The food is so incredible. I'm definitely trying this out. Ooh this makes me kind of hungry...! This looks so delish! Wish I could go today for lunch! Hmmm, yummy... so glad I ate before checking this out! It's places like this& blogs like yours that make me wanna go back to NYC for a city break! Thanks for stopping by! These food pictures are making my mouth water!! NYC has the best restaurants. I can't wait to visit again! Hello dear, I have an award for you. Visit my blog for details. Ooh thanks for the link! 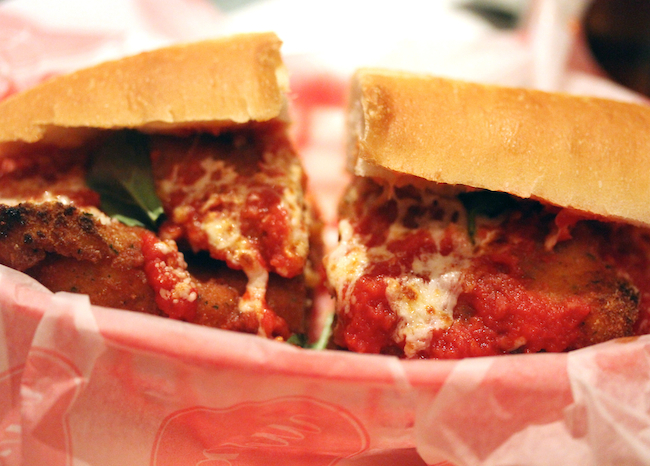 There is nothing like a chicken parm sandwich on a cool day! I hope I can drop by next weekend! YUMMMMMMMMMM OMG THAT CHICKEN PARM LOOKS ABSOLUTELY DIVINE!!! wow this place sounds amazing! Those are such gorgeous photos! The food looks absolutely mouthwatering. Hi lovely, I like your blog! !